Imagine what it was like being a child on the playground; you would have fun running around and play with no boundaries. Now imagine children who wear cochlear implants or hearing aids having fun on the playground, then they fall, break their hearing device and can’t hear for the rest of the day. What now? At Mill Neck Manor School for the Deaf (MNMSD), established in 1951, we are dedicated to help Deaf and Hard of Hearing children unlock their potential through quality education. Our specially-trained staff, carefully structured programs and access to the newest technologies give our students the academic knowledge and confidence they need to be successful both in and out of the classroom. Our care for each child does not end when the school day does. We strive to ensure each and every child is safe on campus, and in this case, on the playground at MNMSD. To ensure a Deaf child’s safety on the playground, the equipment cannot be plastic because the static will make children’s hairs stand up and can damage their fragile cochlear implants and hearing aids. The playground surface also used to be limited to sand, wood chips, concrete, etc., which does not protect children from damaging their hearing device. Today, our playground is designed especially for those who wear cochlear implants and hearing aids, but the playground surface is not. With your help, we will have the ability to renovate our playground surface from wood chips to rubber mulch. The rubber mulch will help prevent damage to children’s cochlear implants and hearing aids that can occur if a student falls off the playground and were to hurt themselves. This spring season, we ask you to help protect our Deaf children at Mill Neck Manor School for the Deaf. 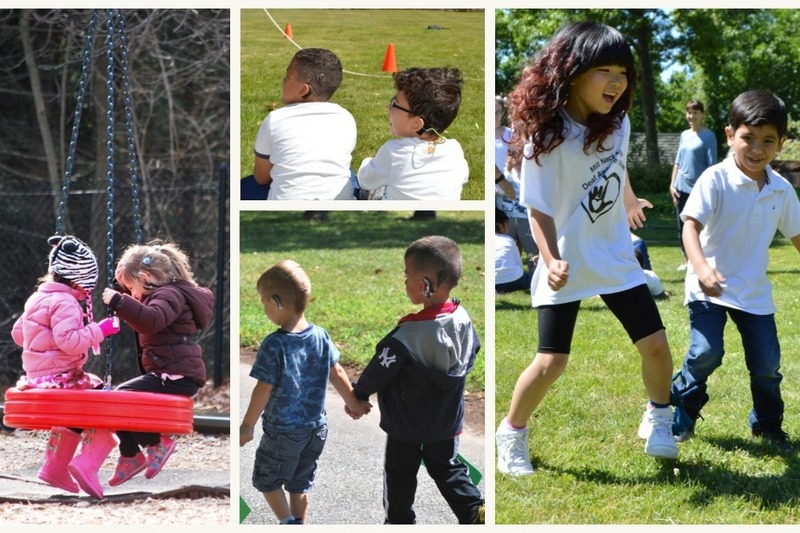 With the rubber mulch renovation, we can be assured that our children who wear cochlear implants and hearing aids can have fun with smiles and laughter while playing safely on the playground.